WASHINGTON — He’s the man who taught The Eagles how to rock. Now, you can see the rock god in person with a pair of D.C. shows over the next few weeks. First, Walsh hits Warner Theatre in Downtown D.C. on Wednesday, Sept. 23, meaning you should plan ahead to navigate the crowds for Pope Francis’ visit the same day. Then, he hits the National Mall on Sunday, Oct. 4 to join Steven Tyler, Sheryl Crow, The Fray, Jason Isbell and the Goo Goo Dolls’ John Rzeznik for a rally against addiction (more on this next month). Music fans will long debate the most fruitful periods of Walsh’s career. Some love his early work with James Gang, from “Funk #49” (1970) to “Walk Away” (1971). Others love his solo efforts, from “Rocky Mountain Way” (1973) to “Life’s Been Good” (1978). And perhaps his biggest contribution to music history was infusing a harder-rock sound into the original country-pop origins of The Eagles. 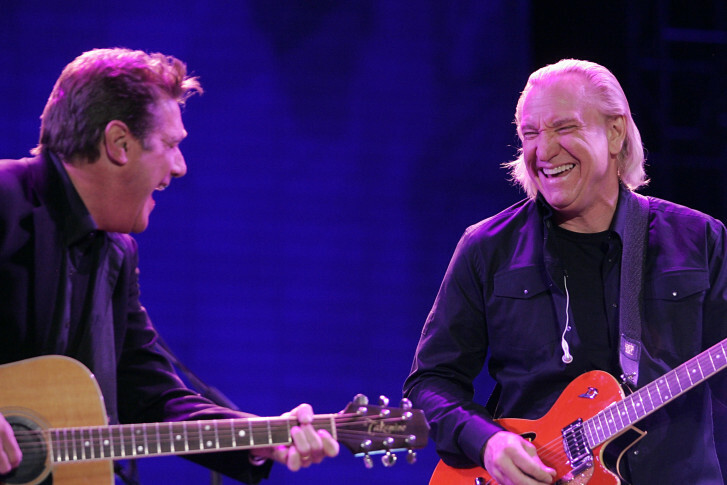 “There’s a magic when they sing together,” Walsh says of Eagles vocalists Glenn Frey and Don Henley, who famously harmonized on “Take it Easy” (1972), “Witchy Woman” (1972), “Peaceful Easy Feeling” (1972), “Already Gone” (1974), “One of These Nights” (1975) and “Best of My Love” (1975). Singing wasn’t the only thing Walsh learned from Henley and Frey. On the flip side, Walsh would also like to think he taught Henley and Frey a thing or two. Indeed, few bands have fused country and rock styles more successfully than The Eagles. “We’re an American band!” Walsh declares triumphantly — and for good reason. In terms of overall sales, The Eagles have outsold every band except The Beatles and Led Zeppelin. “U2 claims they sold more, but I don’t know about that,” Walsh says. More impressively, The Eagles’ “Greatest Hits” continues to trade places with Michael Jackson’s “Thriller” as the top-selling album of all time. That bears repeating. The top-selling album of all time. “Twisted” is exactly what you expect from the fun-loving Walsh, who had a reputation as a party animal and famously sang about wrecking hotel rooms. Which lyric does that story remind you of? 1. Have you ever stood on the corner in Winslow, Arizona? 2. Have you ever stayed at the Hotel California and is it really a lovely place? 3. Do you consider yourself brutally handsome? Do you know anyone who’s terminally pretty? 4. Is the Queen of Hearts really always our best bet? 5. Is it true that so many of us live our lives in chains and we never even know we have the key? How do we find the key?